In my Supplements post I briefly mentioned that I’ve found Magnesium really helpful. I want to sing it’s praises a bit more in this post. Magnesium is crucial to many reactions in the body ,in particular those involving energy production in our mitochondria. Dr Myhill gives an excellent explanation of Mitochondrial Failure in ME/CFS here. 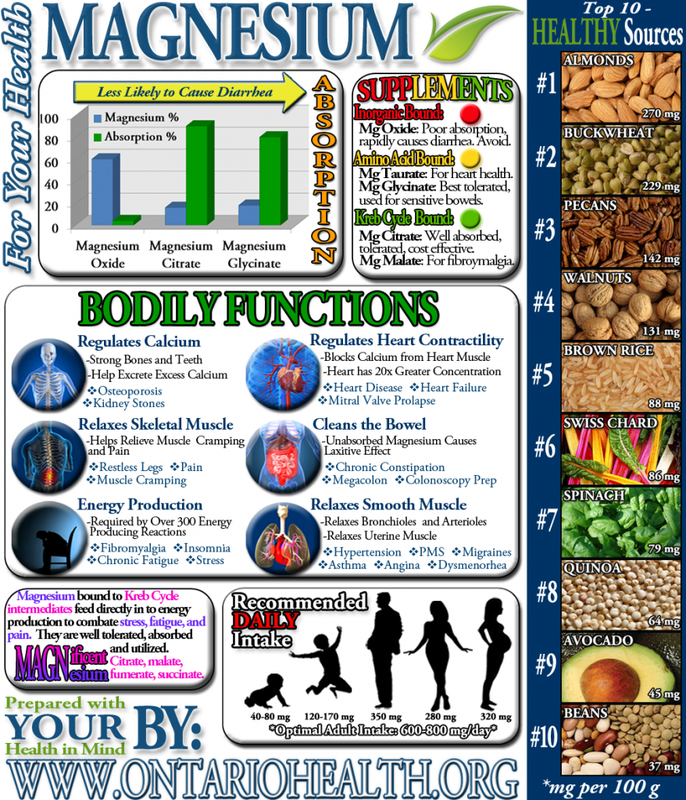 Magnesium is crucial to our health, and yet many people are deficient in Magnesium. Our diets may not contain sufficient magnesium. If you are eating lots of processed foods you are unlikely to be getting sufficient magnesium in your diet. However, due to magnesium depletion in our soils even someone eating a whole-food diets may struggle to get enough magnesium. 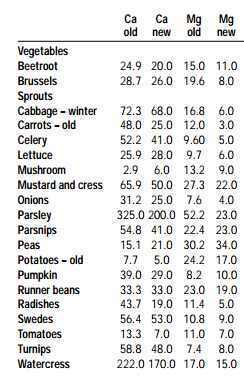 The table below shows the decrease in magnesium in a British analysis of various foods between 1960 and 1994. Another common cause of magnesium deficiency is malabsorption. If you have a damaged gut (e.g. IBS) even if you are eating enough magnesium you may not be absorping it into your body efficiently. Other causes are medications which prevent/reduce magnesium absorption and alcoholism. Additionally flouride, found in toothpaste and some drinking water, may bind to magnesium and prevent absorption. only 1 percent of magnesium in your body is distributed in your blood, making a simple sample of magnesium from a serum magnesium blood test not very useful. Dr Myhill has an excellent article on Magnesium deficiency in CFS/ME. She recommends magnesium injections. 1. via diet. Eating magnesium rich foods such as spinach, chard, pumpkin seeds, almonds, black beans, avacado, figs, dark chocolate and bananas. 2. Epsom Salt baths are a relaxing way to absorb magnesium through the skin. However, I found that although this helped my restless legs, it was not fully effective (I think I wasn’t getting enough magnesium this way). 3. Magnesium Oil: You can buy this in health food shops and spray it on your skin. I have been experimenting with natural deodorants, and found this effective, so I spray it on my underarms and also on particularly achy muscles – usually my calves – before I go to bed. 4. Supplements: I have taken magnesium citrate and magnesium taurate. The taurate was suggested by my nutritionist because of hormone imbalances. I started taking the magnesium as a temporary solution to constipation and noticed that my restless legs stopped, my muscles ached less and I was sleeping better, so I stayed on it. Recently I experimented with removing it, but my symptoms returned, so for now it’s staying. I’ve also noticed since starting my training for the Coast to Coast cycle ride that on days with lots of physical activity it is helpful to me to increase my dose of magnesium citrate. 5. Magnesium injections: This is what Dr Myhill recommends, but I haven’t used this method. It may be worth raising with your GP to see if they will do this for you. Can I overdose on magnesium? Theoretically yes you can. However Dr Myhill says she has yet to see a red cell magnesium level that is too high and my nutritionist told me that I could safely take my multi vitamin containing some magnesium, magnesium citrate and magnesium taurate, and also have an epsom salt bath whenever I wanted. I did not start using magnesium oil until after I had reduced my multivitamin and magnesium citrate and stopped taking magnesium taurate. If you have kidney problems then you should be careful with magnesium supplementation, as in healthy people the kidneys get rid of excess magnesium. Magnesium supplementation in various forms has really helped me, and is one of the few supplements I’m still taking. If my experience resonates with you, then why not try increasing your magnesium intake? You could start slowly by having epsom salt baths and increasing magnesium rich foods in your diet, although if you have a damaged gut you may not absorb magnesium from food efficiently. If the epsom salt baths help, but don’t totally alleviate the symptoms (for me key symptoms were restless legs and muscle aches) then you may wish to consider oral supplements or talk to your GP about injections. If you want to go the injection route I recommend printing out the relevant section of Dr MyHill’s site to show your GP. This entry was posted in helpful foods, my experience, science. Bookmark the permalink. Thanks for the blog, I’ve just spent all day reading through it, having come across it this morning. Everything you have written backs up and resonates with what I am trying to do to recover from CFS. I’ve been following an old low GI diet called The Krimmel Programme, which is similar to Paleo and the Wahl protocol. However there are always subtle differences between all these diets, where do you stand on potatoes/sweet potatoes? I couldn’t see them I either of your good or bad food lists. Your question has prompted a blog post, which I’ll post soon, but in the meantime I eat both potatoes and sweet potatoes. For a while when I was quite Paleo with my diet I did cut out potato, and replaced it with sweet potato. Now I enjoy both. At the start of my illness my blood sugar regulation was really poor, and I think avoiding foods like potato and rice can be helpful in that situation, however, my blood sugar regulation is much more normal now and I feel fine if I eat potato. Think about how you feel after a potato based meal. You might find this article helpful http://www.precisionnutrition.com/regular-vs-sweet-potatoes. Best of luck with your recovery, you can do it.